Moving on now to another questionable global priority – and virtually the largest item in the U.S. federal budget — military spending! We all know war is expensive, but how much so? Well, when the Iraq War was in full swing, it was costing us $411 million every day! –That’s a rate of almost $5,000 every second! Granted, the cost estimates are squishy and controversial, partly because the $12.5 billion a month that were made to pay for waging the Iraq War is only a down payment. We’ll still be making disability payments to Iraq war veterans 50 years from now. A Congressional study by the Joint Economic Committee found that the sums spent on the Iraq war each day could have enrolled an additional 58,000 children in Head Start, or give Pell Grants to 153,000 students to attend college. Imagine the possibilities if America were not a war-based economy. We could rehabilitate America’s image in the world by underwriting a global drive to slash maternal mortality, eradicate malaria and deworm every child in Africa. All that would consume less than one month’s spending on the Iraq war. While the U.S.’s role in Iraq may be terminated, and there have been some budget cuts, unfortunately U.S. military spending machine continues to roar! 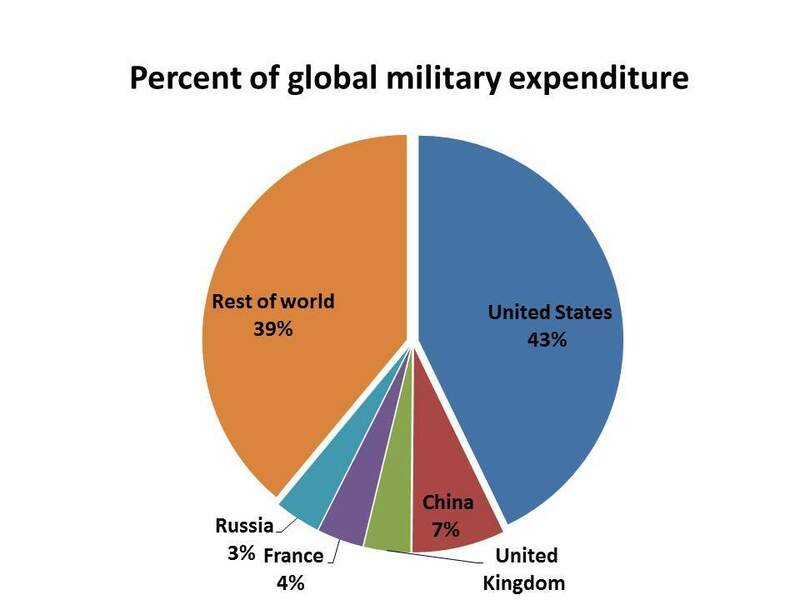 The U.S. still currently spends more on defense than the next 10 countries combined. Defense spending accounts for about 20 percent of ALL federal U.S. spending. U.S. military spending is second only to Social Security, and close to the combined spending for Medicare and Medicaid. Military spending is also more than the combined three departments of Health and Human Services, Education, and Housing and Urban Development.